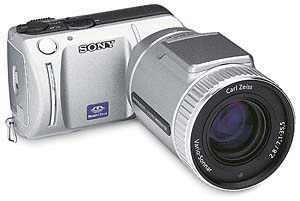 The Sony DSC-F505V is the successor of the Sony DSC-F505 (without V). Unlike its predecessor, the Sony DSC-F505V has a higher Поддерживаемые разрешения , can save pictures in TIFF-format, has additional flash-functions, an external flash connection and is supplied with a 8 MByte Memory Stick as well as MGI PhotoSuite. The Фокусное расстояние and the Скорость затвора (диапазон выдержек) have been shortened and the new firmware allows additional features like the automatic image-alignement and a finer adjustment of the exposure compensation. The serial camera-interface is нетmore present on the new Наименование модели.